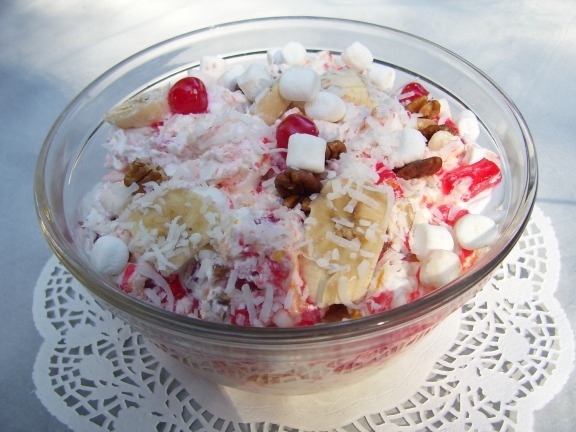 Ambrosia Salad Recipe makes a delightful old fashioned fruit salad with colorful fruits and marshmallows folded into snowy white, Homemade Whipped Cream. It is usually made in the South and served at holidays in a fancy clear glass bowl for a festive look. It is considered by some folks to be a fruit dessert. Older recipes listed only 3 or 4 ingredients such as fresh orange sections, fresh pineapple chunks, marshmallows and whipped cream. One of my old cookbooks, Fannie Farmer's "The Boston Cooking School", list only oranges, pineapple and a little coconut sprinkled on top. Later, nuts like pecans or walnuts, grapes, cherries, bananas and other ingredients began appearing in the dish. Like all recipes of the past, this one has evolved. My recipe is a version of the dish my twin sister used to make that was popular among her friends and clientele. It contains Jello chunks. If you are surprised Jello is an ingredient in this old fashioned Ambrosia Fruit Salad, consider marshmallows are also made with gelatin. The two are similar and add great taste and value to the dish. *See my "make memories" at bottom of page. Prepare Jello and chill until set. Prepare whipped cream and chill until needed. In a large glass bowl and thoroughly drained pineapple chunks and whole orange sections. Add coconut and pecan pieces. Lightly toss all together. Warm honey (about 30 seconds in microwaveable dish to make it easier to pour). Drizzle honey over fruits in bowl and toss all lightly to coat the fruits. Cut 1/2 of prepared Jello into cubes slightly larger than your marshmallows. Add Jello cubes and maraschino cherries to fruits. Gently fold as carefully as possible to prevent them from turning your ingredients pink. Gently, fold in whipped cream. Chill in refrigerator until ready to serve. Can be placed on a salad plate or in individual salad bowls on greens or in a lettuce cup. May also be served as a light dessert with cookies. Small and thin homemade Vanilla Wafer Cookies are great! **The ingredients can be artfully layered in a glass bowl or flat oblong dish to prevent the colors from running, thereby keeping the white marshmallows and whipped cream white. Make 2 or 3 layers of each ingredient, depending on the size of your dish, with the final layer being the whipped topping. Then strategically place additional fruits on top for decoration. When fresh coconut season arrives... October in my area... consider using fresh fruits. They may be available in your area all year. Freshly grated, naturally sweetened coconut is to die for. Especially in this Ambrosia Salad Recipe. Fresh, juicy oranges cut into segments, seeds removed and added along with the fresh pineapple fresh coconut instead of the canned fruits above will "make memories". But, you will never make an uncooked dish using store bought, packaged coconut, that will taste as delicious as fresh out-of-the- hull will. Here is a link to my favorite coconut supplier, Brooks Tropical, How To Open A Coconut. I used those instructions to help me open a coconut. I had to practice a few times, but the results were well worth it. Old-fashioned cake recipes from scratch. A nice collection of classic, blue ribbon cakes... 1st place winners.